THE GROWING POPULARITY OF THE long putter has now spread from country club gates to the pearly gates, as God Almighty announced in a statement that he has added the “broomstick” to his set after a few experimental practice sessions. The creator of the universe has watched with interest as players have won with long putters for three consecutive weeks on the PGA Tour. Adam Scott was the first, rolling to an impressive win at the WGC-Bridgestone Invitational. 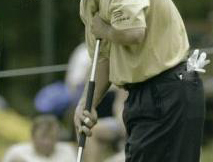 PGA Tour rookie Keegan Bradley followed, winning the PGA Championship with a belly putter in his first major appearance. And on Sunday in Greensboro, North Carolina, Webb Simpson claimed his maiden PGA Tour victory using a long putter. The strong momentum of the long putter among the professional ranks caught the attention of God—who historically is not easy to impress—and was the impetus for the switch. The Lord admitted that he putted “very well” with a conventional putter but wanted to try the long putter to see what all the fuss was about. Next up, he added, is one of his favorite golf outings, the annual father-son tournament. Jesus! why are you punishing us with long putters?lol As you can tell I am not a big fan of the long putter. I suppose its a matter of finding what works for you but look at all these people jumping on the "bandwagon" if someone won the PGA Championship putting with a driver I am sure people would follow. Now, what is God going to do? Keep or remove the bellyputter from his bag? If he asks me, I will tell him to remove it! Thank God the long putter was invented, I have used one for 25 years with deadly effect. Having been a yipper all those years ago and still are I don't know what I would do without my faithful long putter. My mates have been trying to get me to switch back for years, maybe in an effort to win some money back! Great post, cheers. Golf Digest: Are You as Athletic as a Tour Pro?